Logroño is the capital and biggest city of the Spanish region of La Rioja. The city has about 155,000 inhabitants. Logrono Airport is served by Air Nostrum from Madrid. 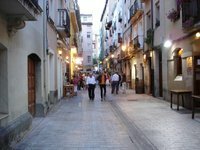 We have a comprehensive list of accommodation in Logroño searchable right here on Travellerspoint. You can use our map to quickly compare budget, mid-range or top of the range accommodation in Logroño and areas nearby. This is version 6. Last edited at 3:41 on Aug 2, 17 by sleepBot. 2 articles link to this page.